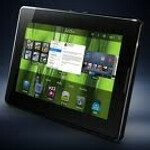 Even though the BlackBerry PlayBook hasn't exactly been flying out the door, RIM is continuing to tweak with the tablet, looking for something that will propel sales. For example, leaked photos that we showed to you recently featured what appeared to be a 4G LTE model of the tablet, with BBM. Additionally, BlackBerry PlayBook OS 2.0.1.358 is now available as an OTA update by clicking on the update notification, or manually by going to settings and then hitting "update software". 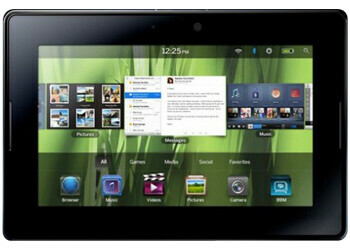 Users activating a PlayBook after Tuesday will have their tablet automatically updated to the latest OS. The new update includes optimizations to video chat, PIM and BlackBerry Bridge apps. It also enhances the BlackBerry Browser and fixes some issues that have made difficult the use of some Android apps on the tablet. 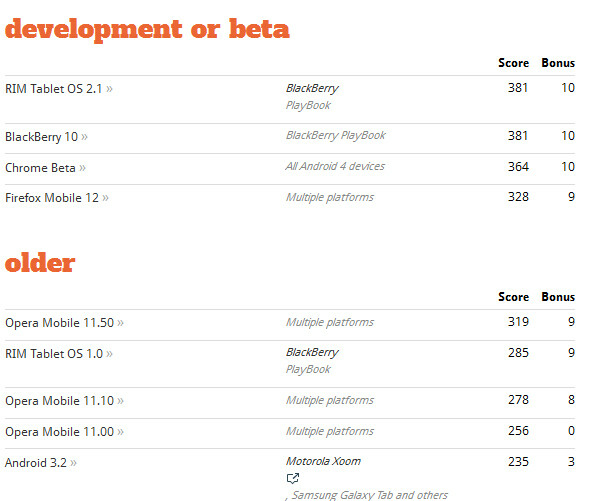 Speaking of the browser, a benchmark test done at website HTML5 Test shows that the browser on the PlayBook 2.0 OS outscored all other tablet browsers (see chart below). Last week, RIM's Alec Saunders announced a contest where the developer of each 100th app for BlackBerry App World over the next week would be eligible to win a trip to next month's BlackBerry 10 Jam in Orlando from May 1st to May 3rd. In just one week, the promotion helped 600 new apps get added to RIM's online application store, and helped 6 developers get their name thrown in the hat to win the trip. The half-dozen apps are Donna’s Premier Lodging by Kickinthe App, Joan Of Arc Comic by ZERO-SUM, LTD, RadDeg by Bartho, Free Molten Magic with OS7 Icons by InProgress™, Hank Aaron Brave in Every Way by Scrollmotion, Inc and LiquidCosts by Bwize ZA. Saunders previously said that 2,000 special BlackBerry 10 powered handsets will be passed out to developers at the Jam, which will run alongside of BlackBerry World Conference. These special units will not have the same looks or navigation as the BlackBerry 10 phone that will be sold to the public later this year. It is merely a way for RIM to get the OS into the hands of its developers in time for some new apps to be, uh, developed before the BB 10 launch whenever that will be. 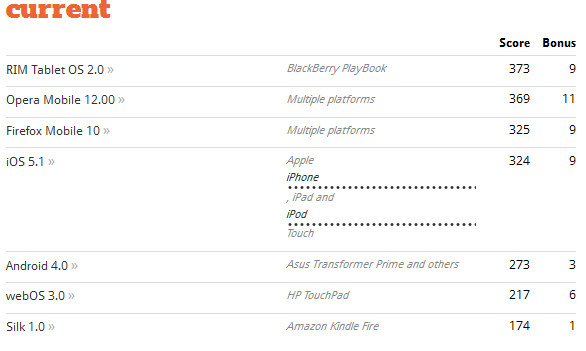 that's the one redeemable thing about the Playbook is it's browser. it's a truly phenomenal browser. The browser really is the best. I too keep Playbook and a big lover of BB mobile, and their App like video chat, PIM and BlackBerry Bridge will make Play book more attractive. I too keep http://www.blackberrytracker.co in my BB. These App help you to locate your Mobile and Playbook once you lost. I do love the browser on my playbook. It may not be as feature filled as some, but it renders webpages superbly both in speed and accuracy. Only major thing I'd like to see is changing Useragent as some sites are forced to the mobile version. This browser doesn't need no stinking mobile sites, it handles the full sites like a champ.